“VAUGHAN – Michael Schmidt was feeling a bit raw Tuesday, following the natural resource ministry’s raid on his farm last week in which samples of unpasteurized milk were seized. The Glencolton Farms owner, along with some 50 supporters, staged a “milk-in” protest at the Christian Community Church on Rutherford Rd. Tuesday afternoon. 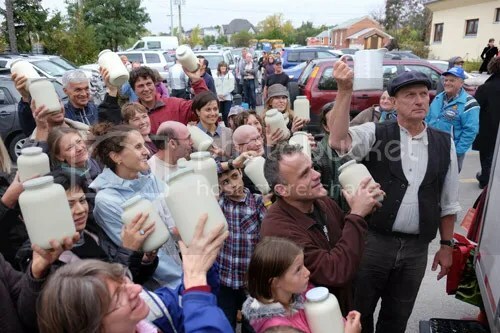 Participants blocked the entrance of a parking lot to prevent any police or MNR officers from entering as they filled coolers with bottles of pre-ordered raw milk.